Mazda finally gave the CX-9, a crossover that I consider to be quite underrated, a long overdue update. Now you have all the style and most of the fun of the CX-5, but with three rows of seats. The biggest criticism, it only has 250 horsepower, really people? We should all be very excited that Mazda is bringing some “zoom-zoom” to those of us that need to haul a family around. Because let’s face it, if you have two kids or more and need to carry gear like strollers or sports equipment on a regular basis, the wonderful Mazda3 and CX-5 just aren’t going to cut it. However, since this is an automotive enthusiast site the one thing that we care most about is MOAR POWER in our crossover. It’s important to keep all this in context, so let’s have a look at a comparision chart courtesy of Edmunds on the power figures from the other top selling mid-size three row crossovers. Yes, they all have more horsepower than the new CX-9, but not by much. Most of you rightly pointed out that where this CX-9 far exceeds its competition is in the torque. Mazda claims the 2.5 liter turbocharged engine will make 310 foot-pounds and that thrust should be available at low rpm. If you look again at the chart above the Honda Pilot with the most amount of torque at 263 foot-pounds, needs to be wound to 4700 RPM to get all that grunt. So why all this talk about torque instead of horsepower? Because in the real world, that is what matters when people say they want something that accelerates well. No sane person is going to be drag racing for pink-slips in their three-row CUV (though that is something I would pay to watch). What people want is a car that has enough power to pass easily and merge safely. Often this scenario involves going from 40 mph to 70 mph onto a highway in a short distance. This is where having a good helping of torque on tap makes a difference. None of the crossovers above would be considered quick by any measure. Now if your outlook on the whole family hauler thing is - “Gas mileage be dammed, I need to do burnouts!” both Dodge and Ford will sell you three-row crossovers with over 350 horsepower. The vast majority of buyers for these types of vehicles are getting these so they don’t have to be seen driving a minivan. Your average 3-row crossover buyer is looking for similar traits as they would in a minivan, something safe, practical, and fuel economy that won’t break the bank. Crossover buyers also want that all-wheel-drive so they can fee invincible in the snow and more importantly a little bit of style so they can retain that last bit of “cool” even though they have kids. 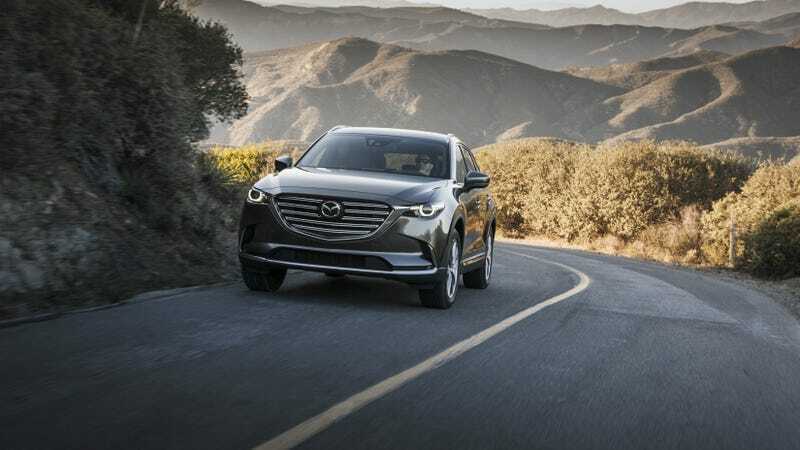 I’ll admit that many of Mazda’s cars across the lineup are little lacking in the power department, especially for a brand whose tagline was “zoom-zoom.” However, I have a hard time believing that folks will find 310 foot-pounds of torque in the new CX-9“sluggish” during the daily commute or on the way to soccer practice.